Although originally from northern Minnesota, Troy attended law school and practiced in Tennessee before joining Rajkowski Hansmeier in 2003. Troy was ranked best oral advocate in his class and served as chief justice of his law school's Moot Court Board. Most of Troy's practice involves defending large insurance companies and their insureds. He has successfully tried several cases to jurors and judges throughout Minnesota. In addition to his insurance defense practice, Troy represents employees across the state in wage and hour disputes and other issues with their employers. He has obtained several large recoveries for his clients, typically through the class action procedure. Troy also has an active mediation practice and serves as a mediator in all types of litigation. Troy became a partner at RHL in 2008. 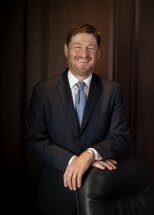 Troy is an active member of the Minnesota and Wisconsin Bar Associations and is the current President of the Minnesota Defense Lawyers Association. He presents on several topics related to trial tactics and techniques. Troy has been perennially voted a "Minnesota Super Lawyers Rising Star" and a "Minnesota Super Lawyer." Troy is an avid reader and outdoorsman. He and his wife, Nicole are active in the St. Cloud area community and they have three children.